Remember those Scholastic find the difference pictures? I loved them! Well this book is kind of like that but it’s only one photo and you have to find a dog. Momo is a border collie who loves hiding while his person takes photos of him. It’s fun to look for Momo, but it’s also neat to see all the photos of the places they travel. I’ve been a Momo fan for a few years. I love trying to find him in the photos Knapp takes. Sometimes it’s easy to spot him, others it’s not. And sometimes I just give up after looking and looking, but I mark the pages I didn’t find him in and keep the book handy so I can go back and hunt for him again. And sometimes again. 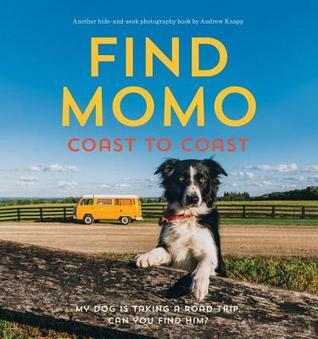 This is a book everyone can enjoy, and it’s fun to do it together with another person or a few people to see who can spot Momo first! This is the second Momo book, the first was Find Momo: A Photography Book. I haven’t checked it out yet but plan on buying a copy soon. If you want a fun book that will also take you on a road trip, get a copy of this book. I love it! Momo books are so much fun! I’ve gotten back to playing hidden object games on the computer recently and have really been enjoying them. This sounds like a fun book and a good one to do with my 5 year old. Plus I can’t resist a border collie! I’m not familiar with these books, but they look good. This book looks like so much fun! I know my kids would love it, as would I. Thanks for sharing on Booknificent Thursday!